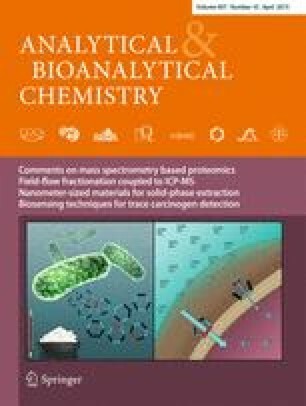 This review presents a comprehensive update on the state-of-the-art of nanometer-sized materials in solid-phase extraction (SPE) of trace elements followed by atomic-spectrometry detection. Zero-dimensional nanomaterials (fullerene), one-dimensional nanomaterials (carbon nanotubes, inorganic nanotubes, and nanowires), two-dimensional nanomaterials (nanofibers), and three-dimensional nanomaterials (nanoparticles, mesoporous nanoparticles, magnetic nanoparticles, and dendrimers) for SPE are discussed, with their application for trace-element analysis and their speciation in different matrices. A variety of other novel SPE sorbents, including restricted-access sorbents, ion-imprinted polymers, and metal–organic frameworks, are also discussed, although their applications in trace-element analysis are relatively scarce so far. Financial support from the National Nature Science Foundation of China (nos 21205090, 21175102, 21375097), Science Fund for Creative Research Groups of NSFC (no. 20921062) and Large-scale Instrument and Equipment Sharing Foundation of Wuhan University are gratefully acknowledged.